Jamison Beulke led the Gusties with 284 All-purpose yards. 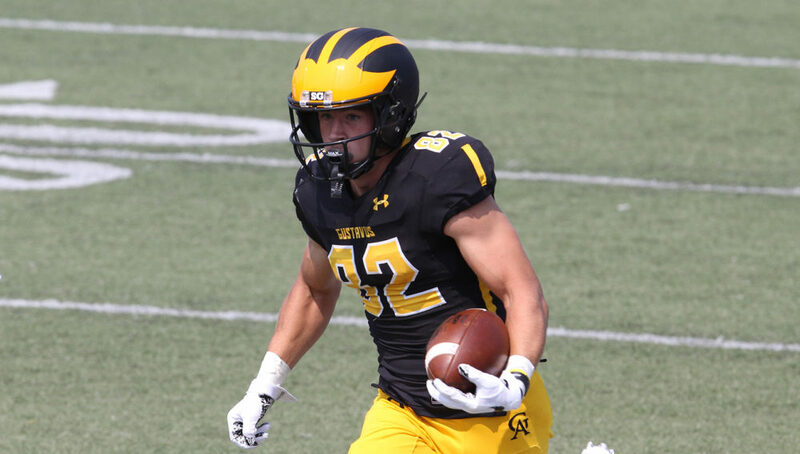 MINNEAPOLIS, Minn. – The Gustavus football team claimed a 42-37 victory over Augsburg University in its Minnesota Collegiate Athletic Conference opener on Saturday afternoon at Edor Nelson Field. Guided by a strong start and offensive onslaught, the Gusties (2-1, 1-0 MIAC) totaled 532 yards of offense to take down the Auggies (2-1, 0-1 MIAC). Gustavus opened the game recording four scores, led by three touchdown passes from quarterback Michael Veldman (Jr., Becker, Minn.) while the Gustie defense limited the Auggies to just one score, taking a 28-7 lead into the intermission. On their second offensive drive of the game, the Gusties completed the sole touchdown of the first quarter, an eight-yard touchdown pass from Veldman to Brice Panning (So., Hamburg, Minn.), his third of the season. The Black and Gold outscored Augsburg 21-7 in the second quarter, led by two more touchdown passes from Veldman along with a three-yard rushing touchdown from Jamison Beulke (So., Montgomery, Minn.). Josh Kirk (So., Garvin, Minn.) brought in an eleven-yard pass for his third touchdown of the season, followed by Beulke’s score to increase the lead to 21-0. After the Auggies’ completed a 27-yard pass for their only score of the first half, Cam Hufendick (Sr., Minneapolis, Minn.) completed his first career touchdown with a four-yard reception as Gustavus took a 21-point lead into halftime. Triggered by a forced fumble, Augsburg stole the momentum out of the gate in the second half, compiling 17 points to cut the Gustie lead to 28-24 heading into the final frame. However, Gustavus maintained its lead as they matched Augsburg’s score total. Each team scored twice in the fourth quarter, another receiving touchdown from Panning and rushing score from Beulke for the Gusties. Down by one score, Augsburg’s last chance to take the lead was taken away with an interception from Drew Fredericksen (Sr., Forsyth, Ill.), solidifying the victory. Veldman finished with a career-best game, totaling the most passing yards by a Gustie quarterback since 2014, completing 35 passes for 430 yards and four touchdowns. Beulke also led the Gustavus offense with 284 all-purpose yards, registering career-high rushing and receiving totals. Beulke led the rushing game with 99 yards on 21 carries and carried the receiving core with 14 catches for 185 yards. Defensively, the Gusties were led once again by linebacker Casey Decker (Sr., Mapleton, Minn.), who totaled nine tackles, including 2.5 tackles for loss, 1.5 sacks, and one pass breakup. In addition, 10 other Gusties contributed tackles for loss. As a team, Gustavus totaled five sacks and 12 tackles for loss. “There is so much to learn this week that will help us down the road. First of all, winning a close game in the end is just an invaluable experience. Making a huge play at the end of the game to win it, with the interception, is huge. Wins are hard to come by, so we are thankful to build on that,” Haugen concluded. Gustavus returns to Hollingsworth Field next weekend, hosting Hamline University on homecoming.